Throughout the development process of protein therapeutics a broad array of analytical techniques is applied on a routine basis to measure various molecular attributes. These measurements are carried out in the context of the quality control system of the product (routine monitoring of the product quality e.g. regarding stability during long-term storage) or as various characterization studies aimed at broadening the knowledge of the molecule. All stages of product development rely on analytical support: cell line and purification development, formulation development, compatibility studies, comparability exercises and also assessment of stability during production, storage and shipping. 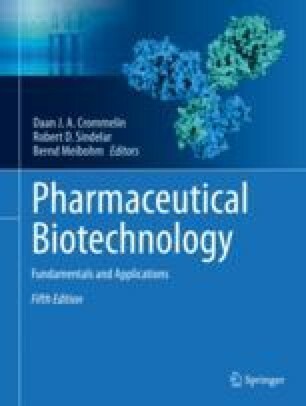 The successful design of product control and characterization strategies to support biotherapeutic development requires intimate knowledge of protein analytical chemistry: the potential modifications that may occur in the protein molecule and the analytical techniques capable of measuring these modifications. This chapter is a re-work of part (including a number of figures) of the chapter “Biophysical and Biochemical Analysis of Recombinant Proteins”, by Tsutomu Arakawa and John Philo, which appeared in the previous editions of this book—cf. fourth edition, 2013. Despite the significant changes made to the original chapter, it still contains fragments of the excellent original text by Arakawa and Philo. The author thanks Abbas Razvi and Marigone Lenjani for providing chromatograms and electropherograms shown in this chapter.